Builderall and Clickfunnels are popular and powerful solutions, with many similarities and differences. Therefore, it can be difficult to know which platform is the right option for your next project. I earn a commission if Builderall or Clickfunnels are purchased. This is how I keep this site updated and completely free to use. There is no additional cost for you if you buy through my links. I have personally used and tested both products in this guide. Builderall is an online, all-in-one business developer, hosted online and marketing platform. By incorporating a large number of features and functionalities, Builderall boasts that it contains all the tools you will need to create and promote your website and business. Builderall was created by Erick Salgado in 2011 to allow entrepreneurs and small business owners to easily manage their Online Presence, marketing and sales processes. This platform focuses on ease of use, website creation and online marketing for everyone, even those without web design experience or technical skills. Regardless of your business ideas, you can not only give them life with Builderall, but more importantly, You can make them successful and profitable. Builderall has the tools to ensure that your vision becomes a reality. Hosting – Builderall uses its own dedicated servers and a content distribution network, based in five different continents, to host any site and page created on your platform. This ensures that websites and content load quickly, and downtime is kept to a minimum. Drag and drop website creators – Builderall offers three intuitive website builders (Pixel Perfect Builder, Responsive Builder and Mobile First Builder). App Builder – Users can create applications using Builderall App Builder. Customizable templates – Builderall offers a wide variety of elegant and professional templates, so if you want to create a website, start a blog, a sales funnel, a landing page or something else, you will find a template that fits your project. Design tools – Builderall has a lot of design tools to ensure that your images and videos are impressive The attention of your audience. The tools include Design Studio, Photo Studio, Video Editor and Builderall Image Spinner, to name a few. eCommerce – With Builderall you can create a complete eCommerce business. Whether you're selling physical, digital or affiliate products, you can do it on this platform. Builderall allows you to promote and manage products, accept payments and even set up an affiliate program. Membership site – Design your own membership site and upload to users a single or recurring subscription to access the content. Alternatively, you can create a restricted area within your website, simply by blocking access to certain pages and publications. Users can log in or pay a fee to view this content. eLearning – If you are thinking about creating an online course or a series of tutorials, Builderall is the ideal platform for this project. Create courses, individual lessons, exams and much more. Then, you can block its content and charge users a premium to access it. Webinars – The webinar tool Builderall will allow you to broadcast webinars live or pre-recorded from your website. Email Marketing – Builderall's own automatic response service, Mailing Boss, has no limits on the number of email campaigns it sets up, or emails it sends. Create attractive emails, track your success, target individual groups of users and much more. 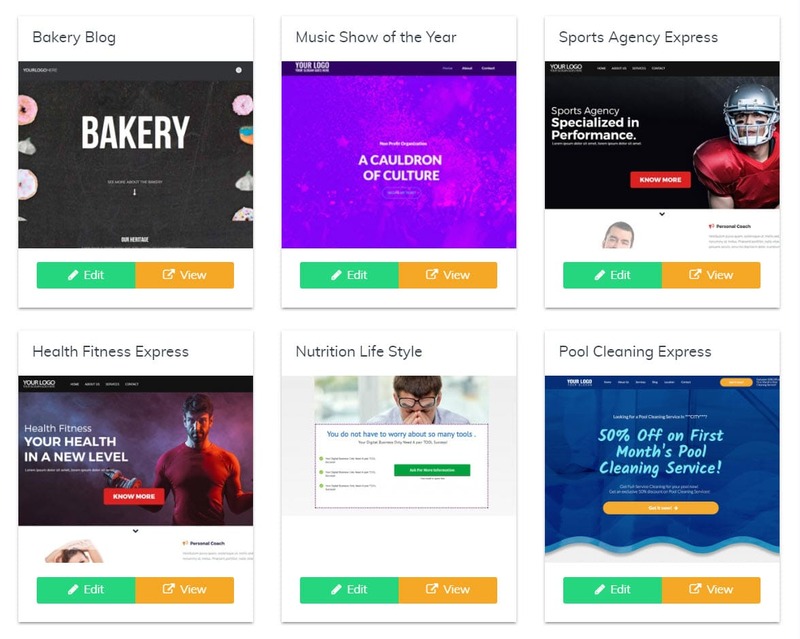 Split tests : Find the designs that best convert by split tests of their content, design elements, web pages, sales funnels and more. Heat map : Understand how your audience browses your website or sales funnel using the Builderall heat map tool. Know where visitors click and what prevents them from making conversions in relation to their objectives. Integrations : Builderall integrates with an impressive number of third-party providers and services. These include PayPal, Aweber, Shopify and many more. Support – There are numerous support channels to ensure that Builderall users can find the information they need on any subject. Explore Builderall's knowledge base, ask a question on the Builderall Facebook page, watch one of Builderall's numerous videos on YouTube, or open a ticket and get expert help from a member of Builderall's support team. Clickfunnels is another all-in-one solution, fully hosted, with a focus on allowing users to create sales funnels and highly-converting landing pages. Like Builderall, this platform provides all the tools and features you need to market, sell and deliver your services and products online. 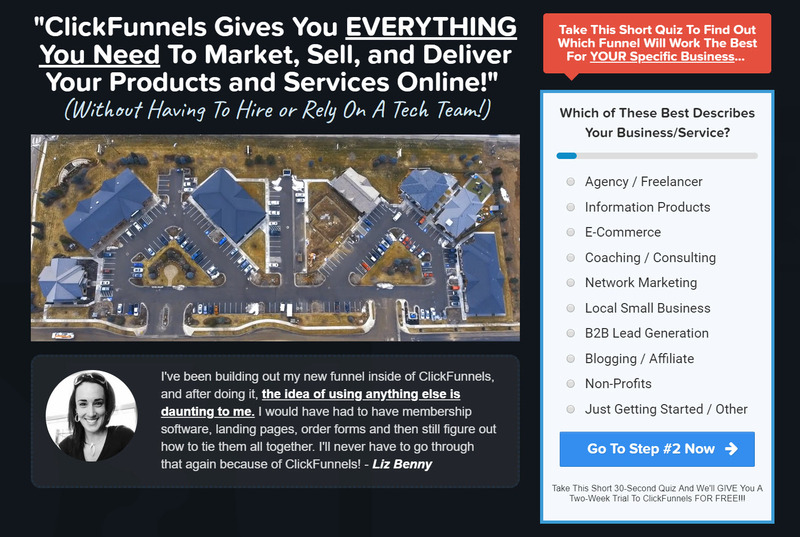 Clickfunnels was created in 2014 by Russell Brunson and Todd Dickerson. Since then, it has grown tremendously in popularity and the business now has a value of more than $ 360 million. Created for entrepreneurs, small businesses, large companies and anyone else who wants to increase their presence online, you can use this tool to generate leads, sell products, promote events and web seminars, and much more. Whatever your goal, you can use Clickfunnels to design a funnel to help you achieve it. Clickfunnels provides a range of funnel sets and prefabricated templates that can be easily customized with its drag-and-drop editor. They can then be displayed on their own domain, added to a website using HTML, shared on social networks or embedded in a WordPress page using the WordPress plugin from Clickfunnels. Predefined templates and funnel sets – Clickfunnels offers a range of templates and sets of prefabricated funnels to allow users to quickly create funnels with style and professionals. You can also select a blank template and design your sales funnel from scratch. Drag and Drop Web Page Editor – The Clickfunnels editor allows you to customize each page of your funnel. Add design elements, change the text, modify the background and much more. E-commerce – Promote and sell products easily through their funnels. Whether you're selling physical or digital products, with Clickfunnels you can make online payments. Clickfunnels is also integrated with the Shipstation e-commerce compliance service, a good option if you want all the packaging and shipping to be taken care of by you. Backpack Affiliate Program – The Clickfunnels Backpack tool allows you to set up and manage your own affiliate program, recruiting affiliates to sell your products. Membership site – Clickfunnels provides a series of funnels for the membership site that will allow you to promote your site, and then allow your users to register and access the content. 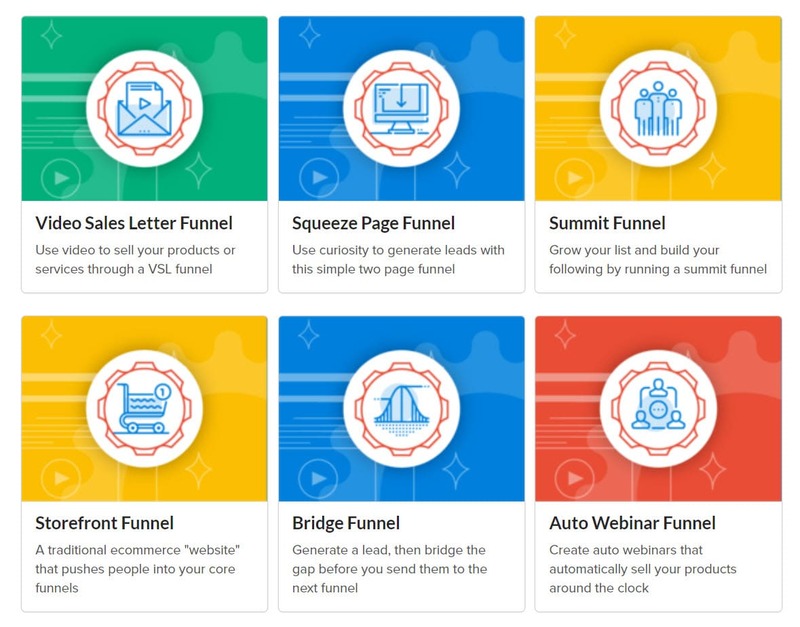 Webinars – If you want to organize a webinar, Clickfunnels also offers a selection of webinar funnels that you can use to advertise and then run your webinar automatically. Email Marketing – You can connect your Clickfunnels account to several third-party Email Marketing Services, including Aweber, MailChimp, Hubspot and many more. Likewise, by opting for the Clickfunnels first level package, you can access Actionetics, the internal marketing automation platform. Integrations – Clickfunnels integrates with a wide variety of third-party tools and services. These include Shopify, Zapier and WordPress, to name a few. Division tests – With Clickfunnels you can perform division tests of any aspect of your funnels, from different design elements, to colors and text. This will help you understand what designs attract your audience and, most importantly, what designs are becoming based on your goals. Analysis : Clickfunnels tracks the analysis of your funnels, allowing you to easily see the performance of each one. From this data, you can monitor conversions over time, page views, user behavior and much more. Technical assistance and documentation : users can benefit from extensive assistance through the Clickfunnels knowledge base, as well as connect with the Clickfunnels community through Facebook, YouTube, support forums, and more. You can also send a support ticket to the Clickfunnels help team. The templates are 100% customizable in one of the creators of Builderall websites, and you can also select a blank template and create your website or web page from scratch. The templates are all modern in appearance and, most importantly, contain design elements and features relevant to their individual niches. 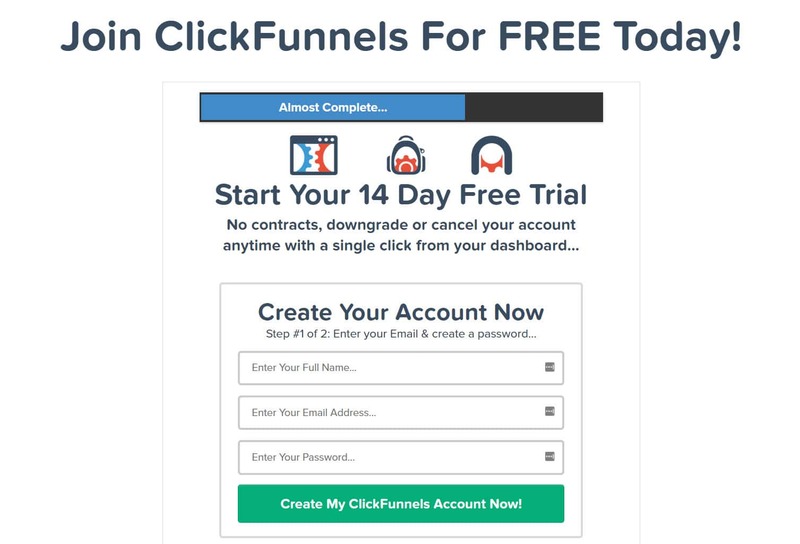 The Clickfunnels tool has been designed to help users create sales funnels. Consequently, Clickfunnels provides a range of predefined sets of funnels and matching landing page templates. These are based on both the industry and the objectives, which helps you find the right funnel not only for your niche, but also to ensure that you achieve your goals. 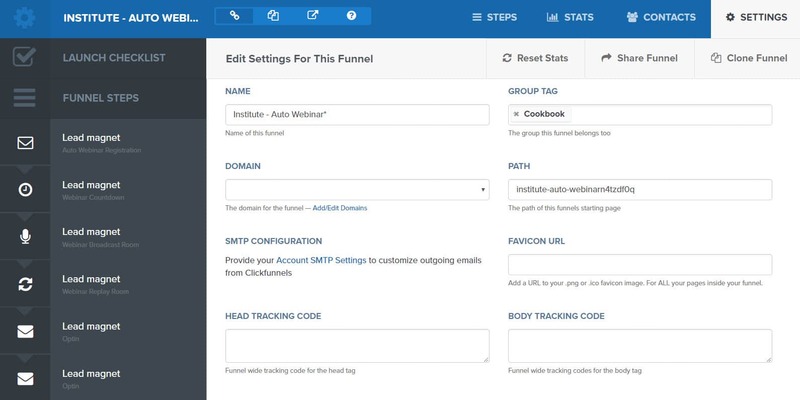 Like Builderall, templates for Clickfunnels can be customized in the editor. And although Clickfunnels does not offer as many template options as Builderall, the ones provided are fully optimized for conversions. 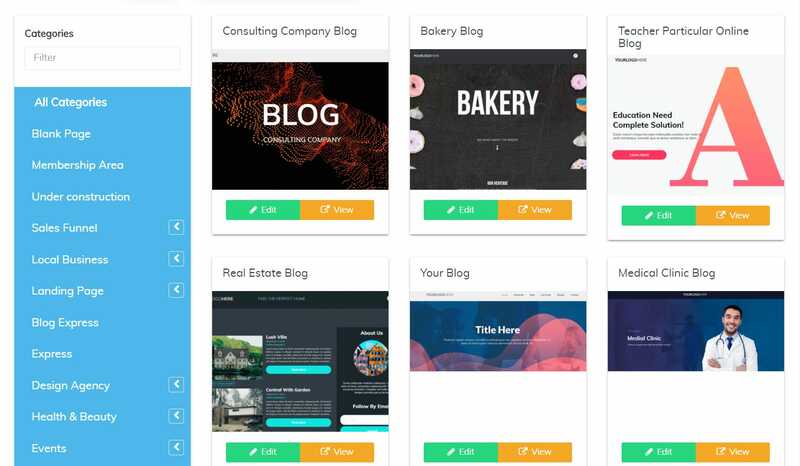 As you can see, both Builderall and Clickfunnels offer a variety of impressive templates to choose from. If you are simply looking to create funnels, the funnel sets and highly optimized Clickfunnels landing pages are perfect. However, if you are looking to design your own website, Builderall will have templates and resources to meet this need. Drag and Drop Pixel Perfect Builder is the original builderall builder. If you choose to use this generator, you must create your website three times in one: a desktop version, a tablet version and another for mobile devices. For some users, being able to control how your website appears on different devices will be a real benefit. For others, it is not convenient to have to design your website three times. If you prefer Builderall to make sure that your website is receptive, then it is better to use the Responsible Generator of Drag and Drop. With this tool, you only need to design your site once, and Builderall modifies the design and layout to ensure your site is responsive on all devices. The other two builders are also effective tools for anyone looking to create mobile products or specific applications. All Builderall builders are extremely intuitive and allow an easy and fun design process. Users can browse a wide variety of design elements and media that can be placed anywhere on a web page. The elements can be repositioned simply by dragging and dropping them on the screen. Clickfunnels provides just a drag and drop Editor that can be used to customize all templates and funnel sets available. 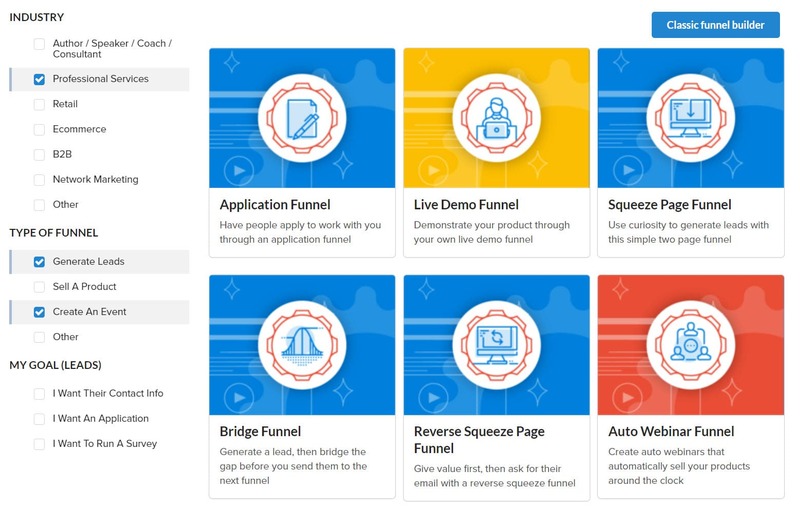 However, Clickfunnels also incorporates a separate funnel control panel, where most configurations, integrations and other funnel options can be customized. Within the Clickfunnels editor, you can add many design elements to your funnel again. Then you can drag and drop items around the page, positioning and changing the size of the elements in seconds. Clickfunnels also allows you to upload images and other media, or search for file images from Pixabay, IconFinder and UnSplash, without even having to leave the editor. Videos can also be inserted from YouTube, Vimeo and Wistia. It is evident that Clickfunnels and Builderall provide impressive builders that allow users to create professional and elegant web pages. The personal choice will be the decisive factor between these two tools, so it is worthwhile to play with the Clickfunnels editor and Builderall builders before making a decision on which platform is the best option for your project. When you publish your Builderall website or your sales funnels, your two options are to simply use a free subdomain of Builderall, or buy a domain and connect it to your Builderall site. Builderall. There is no option to integrate your web pages with any other website or software, such as WordPress, which makes Builderall a very independent product. 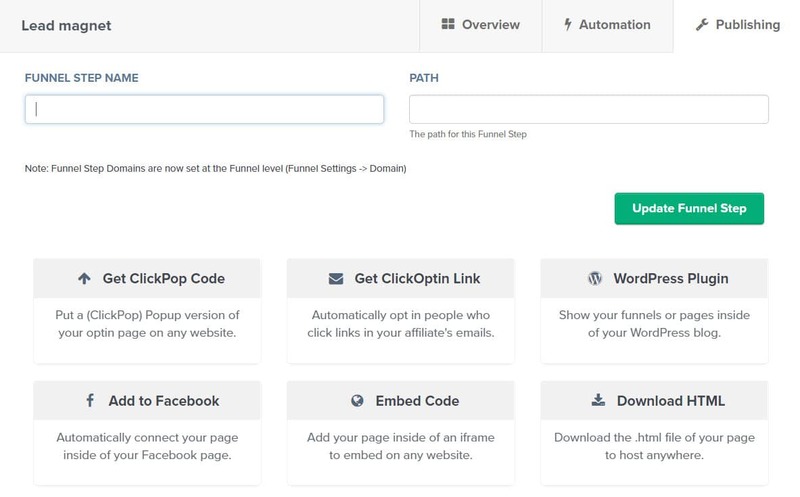 WordPress – Use the WordPress plugin from Clickfunnels to easily embed your funnels on your WordPress website, on any page or publication. Embedding Code – Add your funnel pages within an iframe and then embed it in any website. Download HTML – Download the .html file from each funnel page and then stay anywhere. ClickPop Code – Add a ClickPop version of your channel on any page of any website using the ClickPop code. Add to Facebook – Connect and automatically display your funnel within your Facebook page. In addition to all these publishing options, Clickfunnels also makes it extremely easy to share your funnels on social networks. Obviously, if you are looking to create more than a separate website, and you want the funnels that integrate with your existing sites and pages, Clickfunnels is the tool for you. However, if you are starting a website from scratch, or do not need to integrate your web pages with any other software or website, then Builderall may be sufficient. It is important to note that Builderall allows you to send unlimited emails to an unlimited number of recipients. Actionetics also allows you to send unlimited emails and collect an unlimited number of contacts. Both Clickfunnels and Builderall are also integrated with third-party email marketing services, such as Aweber and MailChimp. Builderall has an in-depth knowledge base that can be accessed from the Builderall control panel. Here you will find numerous videos to share tutorials and training material, which will help you make the most of this platform. The only drawback of these videos is that some must be updated to match the improvements that have been made in some of the functions of Builderall. Builderall Facebook page – Connect with over 30,000 Builderall users, ask questions, share ideas, read success stories and much more. YouTube Channel Builderall – This inspiring channel shares the best tips, best practices and weekly live chats. Support tickets – The Builderall team is always at your disposal to help you personally with your problems or queries. Simply send a support ticket through the Builderall control panel and the team will communicate with you with the information you need. As you can see, Builderall support options are very broad. So, what about Clickfunnels? Like Builderall, Clickfunnels also has multiple support channels. In addition to an extremely organized Help Center, Clickfunnels also provides videos and main suggestions within its Clickfunnels control panel. This helps users understand the funnel creation process, make sure they choose the correct funnels to support their business objectives, and have a clear idea of ​​how to use each funnel to receive the most conversions. Clickfunnels support channels also include …  Community Forums – Within the Clickfunnels knowledge base, you can also access the Clickfunnels community forums. Here you can look for previous discussions or post your own questions. Clickfunnels Facebook Page – This page is currently followed by almost 200,000 Clickfunnels users and is an inspiring resource for those looking to successfully create sales funnels for their business. Clickfunnels YouTube Channel – Follow Russell Brunson and discuss tactics and strategies to help increase sales and conversions. Support tickets – Send a support ticket to the Clickfunnels support team for answers to any questions you may have. As you can see, both Builderall and Clickfunnels provide a large number of support channels. So, whether you are starting on one of these platforms, need help with a problem or are simply looking for inspiration, then you will find the solution you choose. To get started with Builderall, you must register for the service and complete basic contact information. Before leaving with a credit card, Builderall offers a seven-day trial, so if you are not sure it is the right solution for your project, this is an offer worth taking advantage of. Once you have logged in, you will be inside the Builderall control panel. Here is an interesting welcome video that shows you the platform and helps you become familiar with the most useful and important aspects of the solution. <img class = "alignnone size-full wp-image-5899" src = "https://cdn.makeawebsitehub.com/wp- content / uploads / 2019/01 / Builderall-Dashboard.jpg "alt =" Builderall Dashboard  The first step in creating a website is to select which website creator you want to use from the menu on the left, options include. ..
Pixel Perfect Builder Drag and Drop – This builder allows you to control the look of your website on mobile, desktop and portable devices. Drag and Drop Responsive Builder – Create your The website or the pages once, and then Builderall will make sure that its content is fully responsive on all devices. First mobile drag-and-drop constructor – Use this generator to create a site compatible with devices mobiles. All builders us similar designs and features, although the Drag and Drop perfect pixels builder provides a wider range of templates and sales funnels. Once you have chosen the appropriate website creator for your project, then you must select the correct template. Here you can filter the left-hand menu templates Categories to find a template that fits your sector or niche. Select View to see a preview of each template, and when you have made a decision, click Edit . Your template will now open within the Builderall website generator. Pages – Add pages to your site easily and then manage page features, including SEO, domain settings , language options and much more. . Text – Select font design groups and manage font styles, colors, size and more. Elements – Builderall provides a wide variety of design elements that include pop-ups, buttons, images, video, audio and forms, to name a few options. Payment and shipping – If you want to sell products or services, you can add payment options and manage sales and payment methods. Builderall website builders are extremely intuitive, and page elements can be dragged and dropped around the page to change their positions and size. Once you are satisfied with the changes you have made to your template, Preview your website and then select Save from the top menu bar. Para comenzar con Clickfunnels, primero deberá registrarse haciendo clic en el botón etiquetado Comience su prueba gratuita de 14 días . A pesar de que Clickfunnels ofrece una prueba gratuita de 14 días, aún tendrá que desprenderse de los detalles de su tarjeta de crédito para hacer uso de esta oferta. Una vez que se haya registrado con En este servicio, su pantalla mostrará el panel de control de Clickfunnels. Aquí puede acceder fácilmente a muchas funciones de Clickfunnels, incluidas sus herramientas de gama alta, Actionetics y Mochila. Dominios – Clickfunnels le permite conectar su propio dominio o comprar un dominio con ellos. Los nuevos miembros también reciben un dominio gratuito durante el primer año de membresía de Clickfunnels. Integrar un proveedor de correo electrónico : aquí puede elegir entre numerosos proveedores externos, como MailChimp, GetResponse, Infusionsoft y muchos más. Igualmente, puede seleccionar integrar la aplicación de correo electrónico Actionetics de Clickfunnels que está disponible para cualquiera en el paquete Etison Suite. Pasarelas de pago – Si desea realizar pagos a través de su embudo de ventas, deberá seleccionar e integrar un proveedor de pagos. Los proveedores de pago de terceros incluyen Stripe, PayPal, ClickBank y más. SMTP saliente : se incluyen los correos electrónicos cuando registra un dominio personalizado, pero también puede agregar su propio servicio SMTP existente para que pueda enviar correos promocionales , facturas, notificaciones de envío y otros correos electrónicos transaccionales. Una vez que haya agregado las integraciones necesarias y haya configurado las otras configuraciones, ahora está listo para crear un embudo. Megan is a freelance writer who loves all things WordPress. She currently lives in Brighton with her partner and two small children. When she isn&#39;t online she likes walking by the sea, coffee and traveling anywhere and everywhere. She is available for hire so check out her site jonesblogs.com.